Apache will “completely exit” the Kitimat LNG project, company CEO Steven Farris told investors Thursday as the company reported its second quarter results. “We have said for some time that Canada is part of our North American onshore portfolio,” Farris told analysts in a conference call. The Horn River and Liard natural gas fields would have served the LNG project. The divesture could either be as a complete package or sold separately perhaps through the capital markets. The Duverney Shale and Monteny shale plays are considered North American assets, while the Horn RIver Liard plays are considered international because the product from there would be sold in Asia via an LNG terminal. Chevron, the 50 per cent partner with Apache in Kitimat LNG, said it would have no comment on the Apache move until its own investor conference call Friday morning. Apache also intends to divest its stake in the Australian Wheatstone LNG project, where Chevron is also a partner. Farris and other executives repeatedly emphasized on the call that the Kitimat and Wheatstone sales were part of an overall change in company strategy. “I have to honestly say that the complete exit by Apache will not have an impact on Kitimat going forward one way or another,” Farris said. Apache has been under pressure from a giant New York based hedge fund called Jana to get out of the international market and concentrate on proven North American markets. Some other financial analysts on the call seemed a little skeptical about the move, with a couple of questions focused on whether Apache was giving up long term investments. “In terms of business and priority of capital and time frame of LNG specifically Kitimat it make sense for someone to own it who has a different timeline,” Farris said. The executives would not say how much Apache has spent on Kitimat LNG so far, but it has been estimated at $2 billion just this year.Upgrading the old forest service road to a modern highway capable of supporting heavy truck traffic was estimated to cost $25 million Kitimat LNG officials said late last year. As for the selling price, Farris said that company will hold out for the best deal, saying that Apache has got a “fair price” for international assets that is has already sold, adding that when it comes to Kitimat and Wheatstone. “We won’t sell at prices that don’t make sense,” whether that comes from a package deal with the northeast BC shale assets or through the capital markets. Overall, Apache Corporation is making money, announcing second-quarter 2014 earnings of $505 million Net cash provided by operating activities totaled approximately $2.3 billion in second-quarter 2014, compared with $2.8 billion in the prior year, with cash from operations before changes in operating assets and liabilities totaling $2.2 billion, compared with $2.6 billion in second-quarter 2013. Apache’s exit, however, does increase the uncertainty in both the short term and long term development of LNG export terminals in northwestern BC, and clearly shows that Premier Christy Clark made a mistake in promising that the provincial economy will boom thanks to LNG. I am determined to get a tighter grip on business performance management in the company, and improve thebalance between growth and returns. Our financial performance for the second quarter of 2014 was more robust than year-ago levels but I want tosee stronger, more competitive results right across the company, particularly in Oil Products and NorthAmerica resources plays…. Sharper accountability in the company means that we are targeting our growth investment more effectively,focusing on areas of the business where performance improvement is most needed, and driving asset sales innon-strategic positions…. We see attractive growth opportunities there such as natural gas integration and liquids-rich shales. We are taking firm actions to improve Shell’s capital efficiency by selling selected assets and making tougher project decisions. We have completed some $8 billion of asset sales so far in 2014. This represents good progress towards our targets to focus the portfolio, and to maintain the financial framework in robust health. Aurora LNG, a partnership headed by Nexen, the Canadian branch of CNOOC, one of China’s largest energy companies, has applied to the National Energy Board for an export licence to ship 24 million tonnes of liquified natural gas over 25 years to Asian customers from Grassy Point near Prince Rupert. Two Japanese companies, Inpex Corp and JGC are partners with CNNOC in the joint venture. The application comes just two weeks after the BC government gave Aurora “the right to pursue long-term access to Crown land” at Grassy Point, which is just south of the border with the Alaska Panhandle. While the NEB is expected to grant the export licence with little difficulty, the company still has to go through environmental assessment and make a final investment decision. So far none of the LNG projects in northwestern BC, including three in Kitimat where the NEB has already granted export licences, have been given that final go ahead from the boards of their parent companies. Tne NEB is also considering five other applications for LNG export licences. The agreement is for the northern part of Grassy Point, which covers 614.9 hectares of land, plus foreshore land equalling 158.7 hectares. Aurora LNG will be examining the viability of constructing a liquefied natural gas (LNG) plant and export terminal at this location. Under the agreement, Aurora LNG will pay $12 million to the Province upon signing the sole proponent agreement. Another $12 million will be paid by Aurora LNG on, or before, the first anniversary of the agreement, as long as the proponent wants the arrangement to continue. The right to acquire the land for construction or long-term use remains a matter of future negotiations. If the land is acquired by Aurora LNG, the $24 million submitted to government will be subtracted from the final sale price. Nexen’s plans include a natural gas liquefaction plant, LNG storage and a marine terminal to handle LNG tankers capable of carrying between 210,000 and 217,000 cubic metres of gas. The initial plans call for two trains with a possibility of two more if conditions in the always volatile LNG market warrant. Nexen is in talks with a number of “major pipeline providers” and no pipeline route has been announced. It is expected the first LNG shipment from Grassy Point would occur sometime between 2021 and 2023. Competitors are trying to sell natural gas to Asian customers using the cheaper Henry Hub North American market benchmark rather than higher Japanese bench mark which is based on the price of oil. The Dow Jones report says Chevron, which is partnered with Apache, is still having problems finding customers in Asia. It quotes George Kirkland, head of Chevron’s upstream business, as saying that the company is offering customers equity stakes in the Kitimat project. 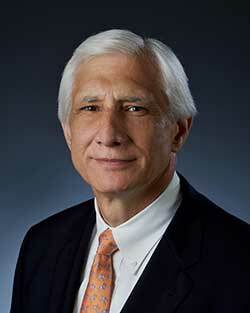 Kirkland told a conference call that equity should be more attractive to buyers. Kirkland said the company won’t approve the project until it has lined up customers for at least 60 per cent of Kitimat’s total 5 million metric tons a year of export capacity, although Kirkland expects that to happen in 2014. “We’ve have had some discussions with Asian buyers,” Mr. Kirkland said during a call with investors. He declined to name the companies with which Chevron was negotiating. “It’s more likely to be a 2014 (decision), not late 2013,” he said. U.S. natural gas prices were $3.37 per million British thermal units Friday, down from $13.69 in July 2008. A report issued by Ernst & Young, The Global LNG Report, says that there will be strong demand for liquified natural gas over the next 10 to 20 years. At the same time LNG buyers will increasingly push back from “price-sensitive buyers who are likely to be less willing to pay supply security premiums. That means that the pricing for LNG in Asia will move away from the link to the price of oil, which, so far, has been driving the potential profit picture of Kitimat’s LNG projects. Even with reasonably strong demand growth, this implies growing supply-side competition and upward pressures on development costs and downward pressures on natural gas prices. Nevertheless, the very positive longer-term outlook for natural gas is driving investment decisions, both in terms of buyers’ willingness to sign long-term contracts and sellers’ willingness to commit capital to develop the needed projects. The report says there have been three waves of LNG development. The first wave was dominated by Algeria, Malaysia and Indonesia, while the second wave has been dominated by Qatar and Australia. The third wave could come from as many as 25 other countries, many of which currently have little or no capacity; but by 2020, these countries could provide as much as 30 per cent of the world’s LNG capacity. compared to potential return, is a lot lower than in many competing countries. 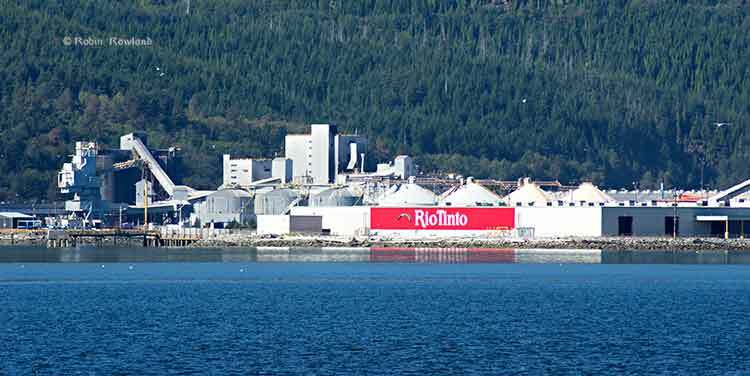 The one problem Kitimat may face in the future is competition from U.S. “brownfield” developments that could turn import terminals into export terminals. Ernst and Young says that country most cited as Kitimat’s competition Australia, is facing problems. LNG project proposals are growing faster than industry’s capabilities to develop them. Generally at the high-end of the cost curve, with development bottlenecks and spiraling construction costs, Australian projects are typically under the most pressure. Sanctioned projects are generally less significantly impacted, but projects still seeking contracted off-take are at substantial risk. One advantage for Kitimat may be that buyers, worried about the volatility of the market, may be more inclined to sign long term contracts. 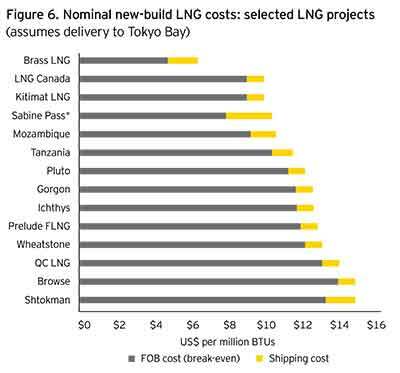 The proposed North American LNG export projects are particularly well-positioned, even though the US Gulf Coast projects will give up some of their Free On Board (FOB) cost advantage with higher shipping costs. As substantial volumes of lower-cost LNG move into Asian markets, projects at the high end of the supply curve – namely, many of the Australian projects – will become increasingly vulnerable. Going forward over the medium-to-longer-term, Ernst & Young expects to see a gradual but partial migration away from oil-linked pricing to more spot or hub-based pricing. 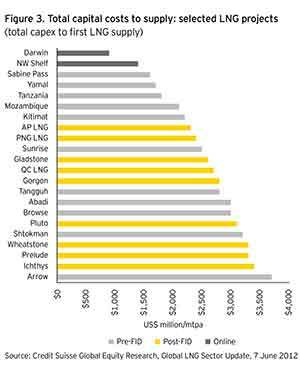 LNG sellers are reluctantly facing realities and are offering concessions in order to remain competitive. British Columbia newspaper magnate David Black says he’ll know in about 60 days whether his controversial idea for a new refinery on the West Coast will move forward or die a quiet death. In a recent interview, Black said he has signed memorandums of agreement with parties interested in the idea of a $15-billion refinery at Kitimat, done some preliminary design work and talked to financial backers — though any deal has a long way to go. If the parties say “yes,” there would be two years of regulatory approvals required before construction could begin, he said. Enbridge Northern Gateway has told the Joint Review Panel that expansion of the proposed bitumen and condensate terminal in Kitimat is urgent so the company can access offshore markets for Alberta bitumen sands crude. Northern Gateway filed an update on its plans for the Kitimat in response to a ruling from the JRP, after Smithers-based activist Josette Weir questioned how Enbridge filed a route update with the panel which included the plans to expand the terminal. The JRP ruled against two of Weir’s motions but upheld, in part, her objection that the terminal plans were not part of a route revision. brief description as to why this evidence is being filed at this time. In response, Northern Gateway filed a spreadsheet with the JRP to clarify the reasons for including the expansion of the tank farm. As the JRP requested, the explanation is brief, but significant. In recognition of the urgency of accessing offshore markets, Northern Gateway and its Funding Participants have recently agreed to proceed with engineering and design activities. …for preparation of a Class III Cost Estimate, at an expected cost of over $150 million. Discussions with the Funding Participants in late 2012 resulted in a more detailed analysis of the tankage required by shippers, with particular emphasis on ensuring an adequate degree of commodity segregation within the tank farm. That analysis, which concluded in December 2012, revealed that additional tankage would be required to satisfy commodity segregation requirements. Northern Gateway included this information along with its Route V filing as a matter of convenience to all involved. In respone to Weir’s objection that the Enbridge Northern Gateway filed a major change to the project and noted that most intervenors are limited to the deadlines set by the JRP, and that the engineering hearings in Prince George had already concluded. In response, the panel ruled that Enbridge could present the evidence at the marine hearings in Prince Rupert that resumed today. addressed through questioning in Prince Rupert, as suggested. 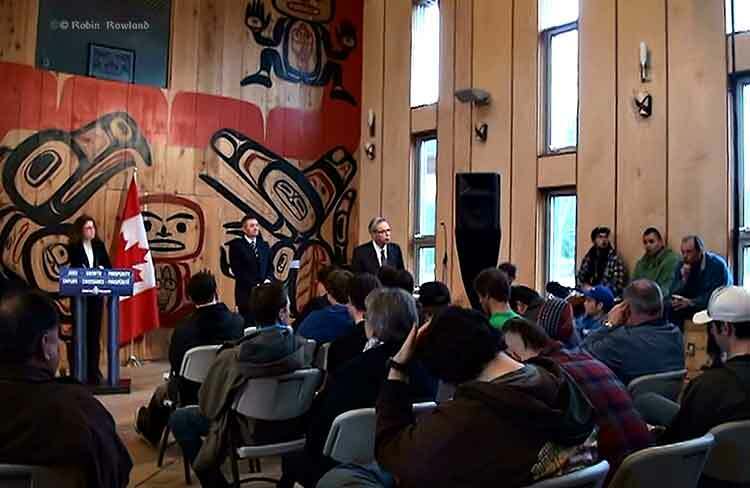 At the opening of the hearings in Prince Rupert, Coastal First Nations withdrew from the process, citing the cost and complexity of the hearings. Both events once again call into question the fairness of the Joint Review Process and whether or not there is a double standard, with one set of standards for Enbridge Northern Gateway and another for intervenors. The Haisla Nation, the federal government and the province of British Columbia have signed an agreement that opens the way for liquified natural gas development on Haisla territory on Douglas Channel. The federal government also announced new regulations under the the First Nations Commercial and Industrial Development Act (FNCIDA). The regulations are necessary because First Nations are still governed by provisions of the century old Indian Act and reserve land is outside of provincial jurisdiction. The federal release also quotes executives from both major companies involved in the Kitimat LNG project, Apache and Chevron. Chevron recently took over operating control of the project from Apache when that company had difficulty finding customers in Asia for the LNG. The proposed project will provide Canada’s energy producers with a doorway to overseas markets, in addition to creating jobs and economic development opportunities not just for the Haisla First Nation, but the entire northwest region of British Columbia. That’s good news for members of the Haisla Nation, good news for British Columbia, and good news for all Canadians. These regulations are passed under the First Nations Commercial and Industrial Development Act, known as FNCIDA, which allows the federal government to develop regulations for complex commercial and industrial development projects on reserve in partnership with First Nations and Provincial governments. For First Nations, FNCIDA can remove the barriers they face in pursuit of economic development opportunities, while providing the certainty investors require, and assuring the community that the necessary oversight measures are in place. Together with the Province of British Columbia and the Haisla Nation, the Government of Canada has also signed an agreement which ensures administrative, monitoring and compliance activities for the facility are performed and enforced by provincial officials who have the necessary experience and expertise. As a result, the regulatory pieces are now in place for project to proceed. Apache has a new partner in the Kitimat LNG project, Chevron Canada Ltd and, in effect, Chevron is taking over the project from Apache who has been unable to find customers for the liquified natural gas project in Asia. Chevron Canada and Apache Canada each will become a 50 per cent owner of the Kitimat LNG plant, the Pacific Trail Pipeline and 644,000 gross undeveloped acres in the Horn River and Liard basins. Chevron Canada will operate the LNG plant, which will be located on the northern British Columbia coast, and the pipeline. Apache will continue to develop shale gas resources at the Liard and Horn River basins in north eastern BC. Encana and EOG Resources — currently 30 percent non-operating partners in Kitimat LNG and Pacific Trail Pipeline — will sell their interests to Chevron and exit the venture. As part of the transaction with Chevron, Apache will increase its ownership of the plant and pipeline to 50 percent from 40 percent. The two-train (stage) Kitimat LNG Project is still working through the Front-End Engineering and Design (FEED) phase. Construction has continued at the Bish Cove site throughout the summer but has slowed down to the uncertainty over the future of the project and some environmental problems. Current plans call for two liquefaction trains, each with expected capacity of 5 million tons of LNG per annum (about 750 million cubic feet of gas per day). Kitimat has received all significant environmental approvals and a 20-year export license from the Canadian federal government. 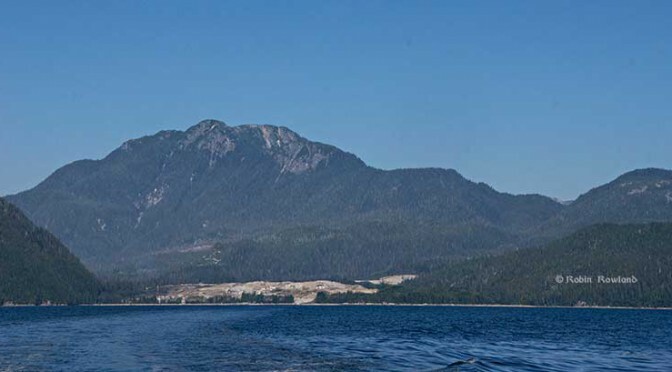 The 290-mile (463-km) Pacific Trail Pipeline is planned to provide a direct connection between the Spectra Energy Transmission pipeline system and the Kitimat LNG terminal. While the Apache release says: “The project has strong support from many of the First Nations along the route,” there is no support at this moment from the Wet’suwet’en, in the area from Burns Lake through Smithers to the mountains, because some houses are strongly opposed to the pipeline on their traditional territory. In the Apache news release, Farris says: “”We want to thank and acknowledge EOG and Encana for their contribution to the development of the Kitimat project. We appreciate the hard work of many employees and contractors to advance the project to this stage and the strong support the plant and pipeline projects have received from local communities, provincial and federal officials and the Haisla and other First Nations. As the news releases point out Chevron is a major player in Australia’s LNG projects, considered by many to be Canada’s rival in finding market for natural gas in Asia. Chevron is the operator and led marketing efforts at Wheatstone, a two-train plant with capacity of 8.9 million tons of LNG a year that is expected to commence operations in 2016. Chevron also operates the Gorgon LNG project in Australia and LNG Angola. Much of the media attention is also on the deal for the natural resources northeastern BC, with, Chevron Canada acquiring approximately 110,000 net acres in the established Horn River Basin from Encana, EOG and Apache, and approximately 212,000 net acres in the Liard Basin from Apache. Chevron Canada Limited and Apache will each hold a 50 percent interest and Apache will operate these two natural gas resource developments. The Financial Post points out that “the Chevron deal leaves most of the LNG projects in the hands of foreign companies, which have competing interests in LNG projects across the world.” That means that the Haisla Nation, with its partnership with the BC LNG project, is one of the few Canadian players left in the LNG scramble.